Every morning as the sun shines through our french doors, I sip my morning coffee, remind myself to begin each day with a grateful heart and think fondly on my power tool wielding son. 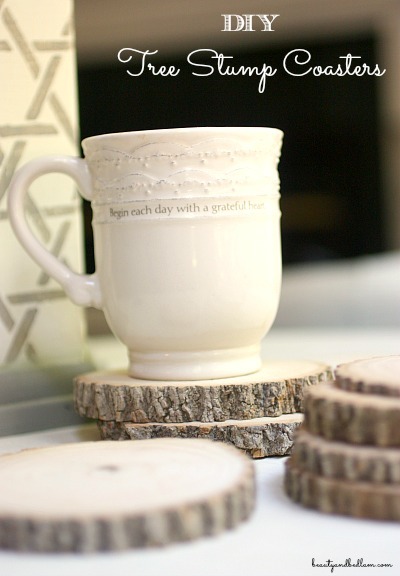 As a little girl, I remember spending time in my grandpa’s woodworking workshop. It was always packed with projects in all stages of completion and he’d share stories about how his grandfather taught him. I didn’t appreciate the legacy of that then, but I sure do now. Out of all his many grandchildren, it was my eldest brother who learned my grandpa’s handy ways. On our homestead, my brother lives next door to us, and out of the 19 cousins/children who had the opportunity to learn woodworking from my brother, no one took him up on it…until this past year. Remember my son’s surprise landscape surprise to me? Yes, that gorgeous swinging bed is finished and has been the hit of all our gatherings. Our #2 son sought out the power tool wisdom of my brother and gained the DIY bug. I’m so grateful because I am reaping the benefits of it for a few months before he heads off to college. This past year, my Instagram feed has shown the wood coasters numerous times. Typically, I’m showcasing my old recipes or something unrelated, but I always get asked about them. Since we are fortunate to have upteen hundred fallen trees on our homestead, we just need to shop our yard for some solid hard woods. You want to make sure they’ve dried, but with no rot. Believe it or not, I spilled on them many times before I decided to experiment with various products to seal them. I had products on hand, so I tried Deco Art Varnish, , Minwax Polyurethane and Furniture Wax . Most of what you see pictured have not been sealed and they have been just fine for months, but I wanted to test it for long term. I’ll let you know which I like best, but any sealing agent would be fine. Have you read about my next big, ginormous dream? Yes, I am shooting over the moon with a two year goal in hopes of building a large “barn”, fully equipped for weddings, retreats, cooking and craft days; basically anything else us creatives can think up. 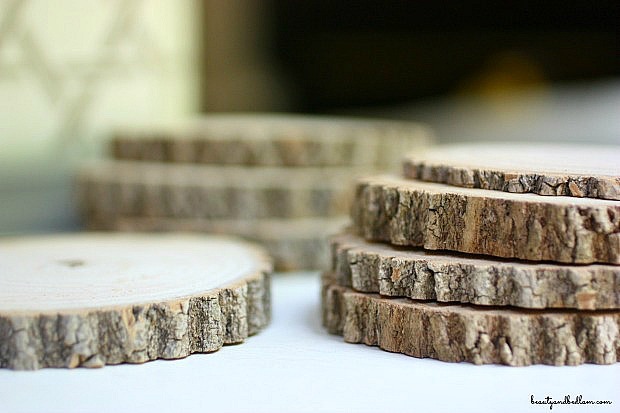 These wood coasters will come in handy as I’m gathering event ideas on my Pinterest Venue board, as well as my tablescape and new simple hospitality board. 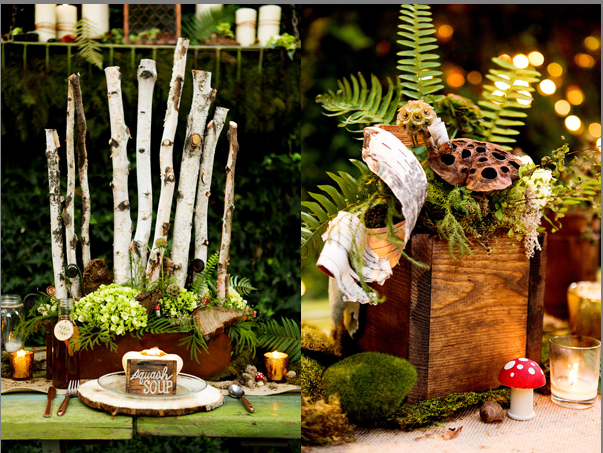 When I saw this elegant, rustic inspiration from BlueBird Productions come through my IG feed, I knew my next stump project. So simple, yet stunning. 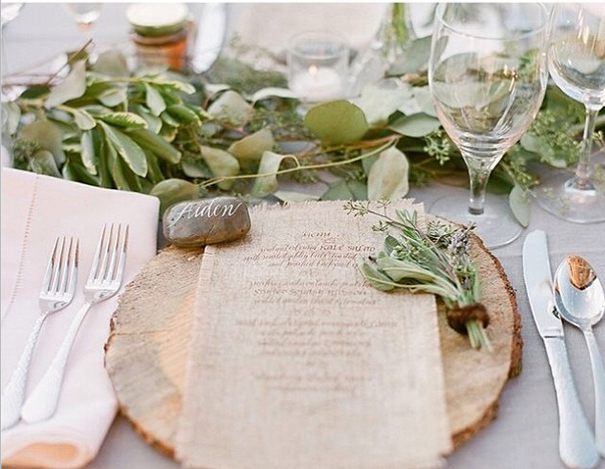 Can you even believe how beautiful this tablescape is? 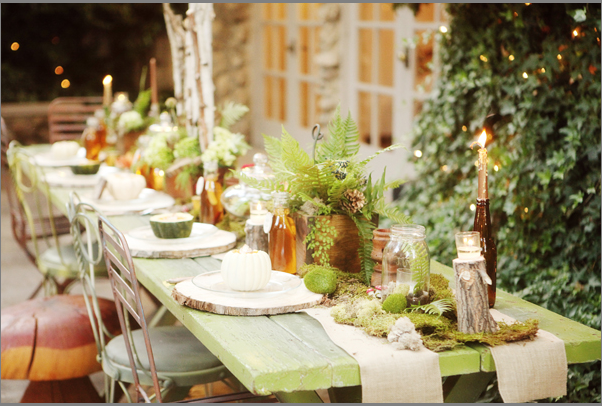 This photo shoot was featured in Utah’s Bride Magazine (2012). 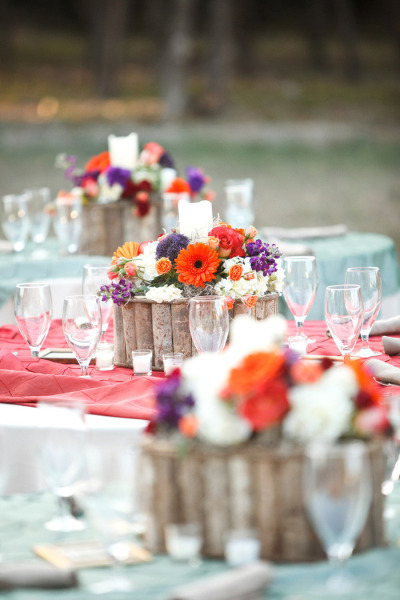 I’m smitten with their inspiration and can’t wait to feature something similar. See it all here. 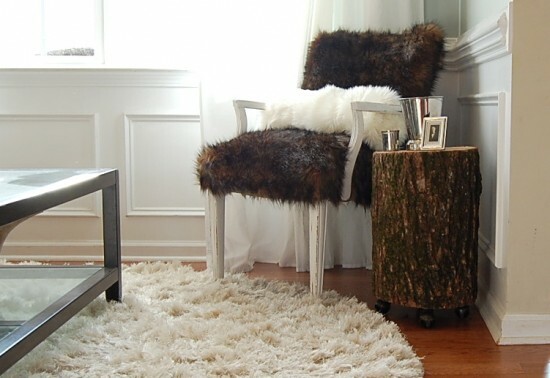 My sweet friend, the Nester, has been sharing her love of stumps for years; mainly in the form of Tree Stump Side Tables. I love getting ideas from One Kings Lane. Sometimes they have great sales, but the inspiration is always amazing. 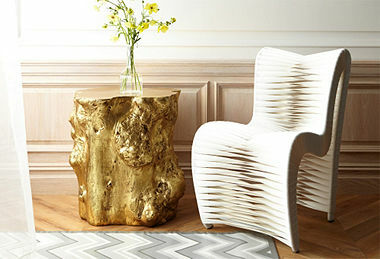 Who would ever have thought to glam up a tree stump with gold? 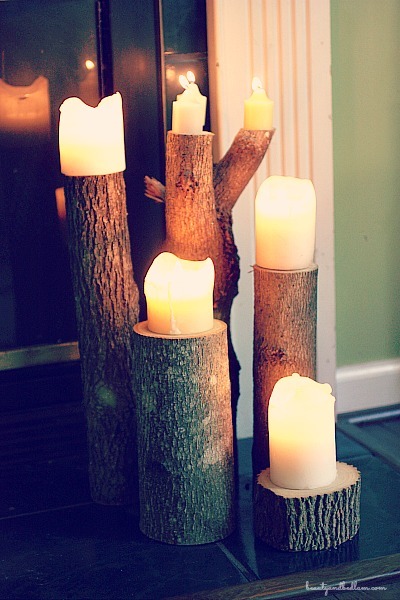 I just adore all the Tree Stump candle holders our son made for me. 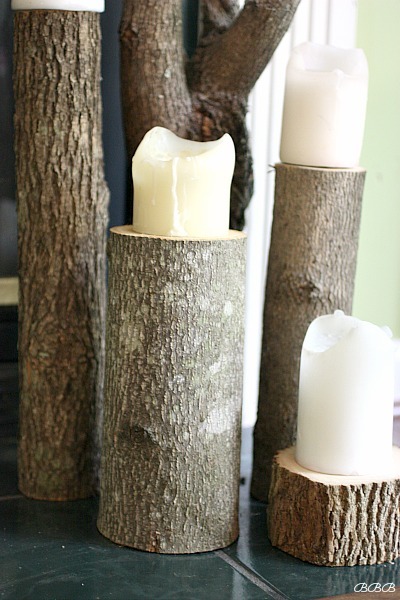 The varying sizes look wonderful by our fireplace and when autumn hits, I will be using some on my mantle. 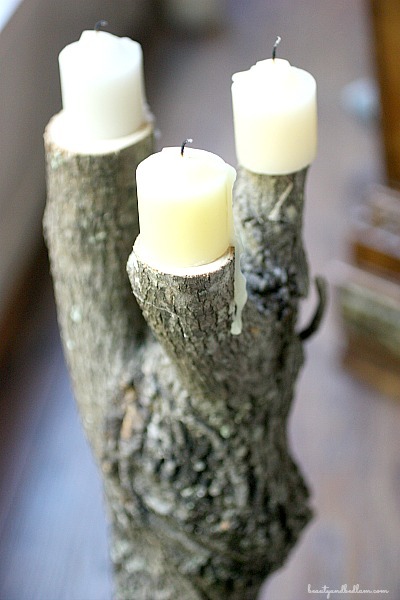 I’ve used tea lights in little jelly jars on the stumps as well. Some of these were a bit too big, but it’s what I had on hand. 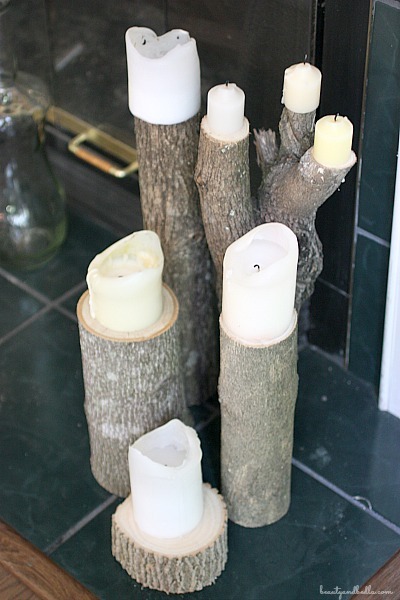 For adult gatherings, I can burn these candles plus balance them accordingly, but honestly, I purchased some Battery Operated Candles so I would never have to worry about them getting knocked over. They look incredibly realistic and I’ve added many to my stash. Now I can burn them for hours with no fear of bedlam striking. Lastly, sheer elegance mixed with a rustic touch makes this such a unique statement piece. 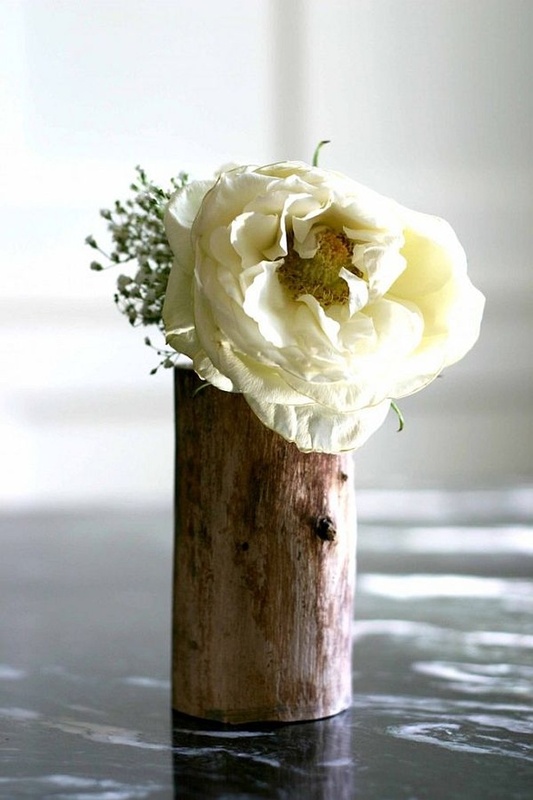 This simple vase insert is perfect from CSI Project. Are your creative juices flowing yet? Aren’t these so fun? I’m so inspired knowing I can do these things without spending a dime. If you don’t have trees around, ask some friends or head out to our homestead. I’m a good sharer. With our son soon leaving for school, I know he won’t be around to finish some of the projects I want completed. My sweet friends, Brittany from Pretty Handy Girl and Sandra from SawdustGirl.com have so inspired me to forget delegating and do it myself. I’ve just started learning to use some power tools and I can’t wait to have these amazing friends, along with my brother, tutor me some more. In closing, I must tangent a bit here. 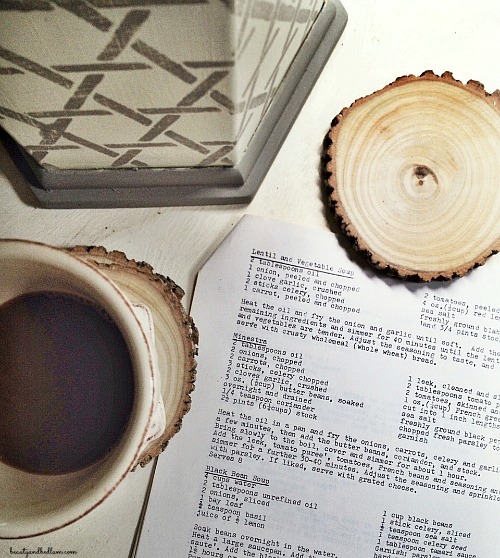 Over the years, I’ve written about saving for quality Kitchen tools. They are a worthy investment. I couldn’t share about my grandpa’s legacy without showing you this picture my brother took for me. This is my great, great grandfather John’s Delta bandsaw. 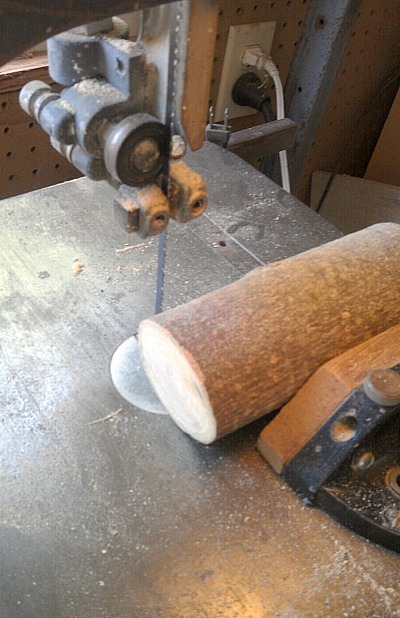 It’s the saw my son used to make the wood coasters. You all, this deserves a post by itself. My brother estimates this saw is almost NINETY, yes 90 years old and it still works unbelievably well. I’m off to walk in the woods and see what other inspiration jumps out! Enjoy! Jen, I’m with you, these wooden decorating items are very lovely. There is nothing better than using one of the many things God created for add beauty in our homes.. I have always held a love for anything made from “real” wood. The age rings, the wood grains, the unique types of wood bark, it all makes into items of beauty. I will look forward to seeing your handywork in future posts. The opportunity to learn woodworking from your brother will be the making of priceless memories. I LOVE this idea! 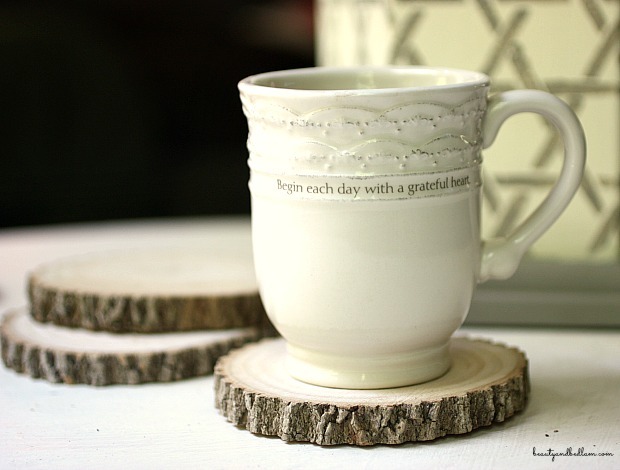 In fact… making these coasters have been on my DIY list ever since I saw them at West Elm this past Christmas! Yours turned out gorgeous!! !